1. Mount components to the PCB from the PLAIN SIDE. Polarity must be observed for DI, (Power Diode) and for CI (Electrolytic Capacitor). (ii) CI - Arrow on Body of Capacitor points down the negative leg. Push the component legs through, nip off 1-2mm clear of the bus-bars and bend leg's in opposite directions. This will hold the components in place. 2. TI (BC558) should be mounted with the flat section in the direction shown. (1) Turn the end of a piece of link wire to a ring and solder together. This ring is attached to a hole in the transistor body by a 1/2 x 1/8" Metal thread screw. The link wire is cut and soldered at B1 - B6. (2) The legs on the transistor are too large to fit into the holes in the Veroboard so solder short lengths of link wire to the transistor legs and solder these to the PCB. 4. Solder electrical wire from Kit to 12V + and 12V - positions. 5. 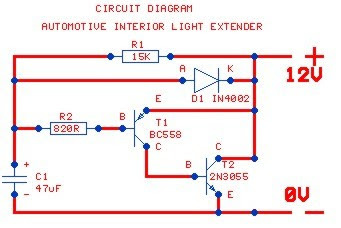 To wire to automobile circuit, the following procedure is recommended. (a) Locate the wire from the Interior Bulb to the switch activiated by the car door. (b) Determine that the car has a Positive Earth or Negative Earth Wiring system by checking the battery. (Most cars use negative earth). (c) For Negative Earth System join the 12V +ve wire from your project to the wire from bulb to switch using the wire-tap from the Kit. For Positive Earth system join 12V -ve wire instead. (d) Ensure that the cover on the wire-tap is folded into place so that no bare metal is exposed. (e) Join the 12V -ve wire from your project to a suitable earth point on the car body. (For Positive Earth system read 12V +ve). NOTE: Do not cut existing wiring to the interior light just join the project in parallel with the switch. (f) Test the unit for correct function. (i) Check for dry joints, joints not soldered at all, or solder bridging PCB tracks. (ii) Check polarity of D1 (Diode) C1 (Electrolytic Capacitor) T1 BC558 PNP Transistor and T2 2N3055 NPN Transistor must be mounted as shown in diagram. (iii) Check locations of all components. All modern cars are fitted with door-switch operated courtesy lights. Useful devices, but not quite as useful as they might be because they are so arranged that the light is extinguished as soon as you close the door - just when you need light to find the ignition switch. do up your seat belt etc. How much better if the internal light stayed on for a few seconds after the door is closed. This little project does just that. It provides a four-second delay (approx) after which the interior light slowly dims - being finally extinguished after 10 or 12 seconds. The unit is very simple to construct and once tested and properly insulated it may be wired across one of the car door switches. In operation, after a short delay the lights will gradually dim until they are completely extinguished. There is no battery drain in the off-state as the unit only operates during the delay period after the door is closed. Most car door switches am simply simglec-pole switches. with one side earthed. When the door is opened the switch earths the other line thus completing the Light circuit. In a car whem the negative terminal of the battery is connected to the chassis the nerative wire of the unit (emitter of Q2) is connected to the chassis and the positive wire (case of 2N3055) Is connected to the wire going to the switch. In. a car having a positive earth system this connection sequence is reversed. When the switch closwe (door open) C1 is discharged via DI to zero rolts and when the switch opens, C1 charges up via R1 and R2. Transistors QI and Q2 are connected as an emitter follower (Q2 just buffers Q1) therefore the yoltage across Q2 increases slowly as C1 charges. Hence Q2 acts Like a low resistance in pars1lel with the switch - keeping the lights on. The value of C1 is chosen such that a useful light level is obtained for about four seconds, thereafter the light decreases until in about 10 seconds it is out completely. With different transistor gains and with variation to current drain due to a particular type of car the timing may be simply adjusted by selecting C1.